Definition: The platinum thermal resistance (PTR) uses platinum for determining the temperature. It works on the principle that the resistance of platinum changes with the change of temperature. The thermometer measures the temperature over the range of 200°C to1200°C. The platinum is an unreactive metal and can easily be drawn into fine wires. Because of these properties of platinum, it is used as a sensing element in thermometer. 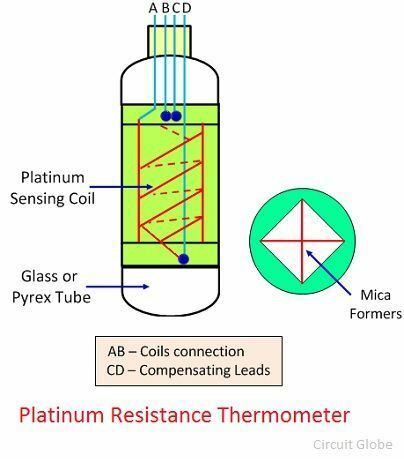 How Platinum Resistance Thermometer Works? The resistance of platinum increases linearly with the temperature, and this property of the metal is used for measuring the temperature. The resistance of the platinum is measured by passing the alternating or direct current through it. Because of the current, the voltage induces across the metal which measures through the voltmeter. The reading of voltage is converted into the temperature with the help of the calibration equation. The figure below shows the platinum resistance thermometer. The platinum sensing coil is enclosed inside a bulb which is either made of glass or Pyrex. The insulator deposit on the surface of the glass tube is also used for sensing the temperature. In this PTR, the double wire of the platinum is wound on the strip of the mica. Here the double wires are used for reducing the inductive effect. The mica is used as an insulator, and it is placed at the ends of the tube. The Ebonite cap is placed at the open end of the tube. The terminals of the copper wire are joined together with the help of the thick copper lead. The other end of the copper leads are joined to the terminal AB fitted in the Ebonite cap. For reducing the effect of copper wire resistance on the thermometer, the two similar copper wires are connected to the upper-end terminals called CD. These wires are called the compensating lead. The industrial type thermometer is shown in the figure below. The platinum wire is protected by the stainless steel tube or by the glass coating. 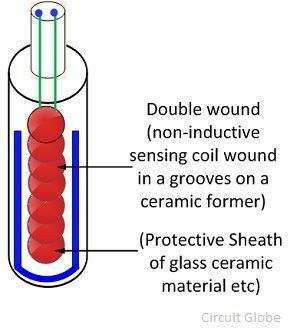 Glass or ceramic seal the sensing element. The sealing has two advantages. They provide the strength to the thermometer and protects the sensing element against the chemical reaction. The temperature measurement through platinum resistance thermometer is easier as compared to the gas thermometer. The meter gives the precise reading of temperature. The thermometer has a wide range from 200 to 1200° Celsius. The thermometer is quite sensitive. The platinum has same resistance at the same temperature. The following are the disadvantages of platinum thermal resistance. The thermometer gives the slow response. The melting point of the thermometer is 1800° Celcius. But when platinum measures the temperature higher than 1200°C they start evaporating. When the thermometer constructed carefully, it provides the excellent sensitivity and high range of measurement.